Charlotte Mason Mondays – CM blog carnival! The more I have experienced the Charlotte Mason philosophy of homeschooling, the more I believe in it. I am discouraged talking with public and private school teachers when they invariably reply, “No, I am not,” when I ask if they are familiar with her teaching methods. Their eyes even glaze when I tell them how well it works! Our homeschooling students actually do learn and the majority even like school, I say of most of the homeschooling families I know. I’m so thankful for Charlotte Mason! I’m thankful for the learning lifestyle we have implemented in our home, I’m thankful for all of the resources we have in the larger Charlotte Mason community (that is you!) and I’m very thankful for the opportunity of having stayed home with my children! What precious relationships have resulted! Not only are we thankful – our kids are thankful, too. They are thankful that school is not so boring. That they are able to be outdoors. That they can listen to music and paint as well as do their math. That we learn by discussion instead of by textbooks and worksheets. So let us remember our blessings this week! 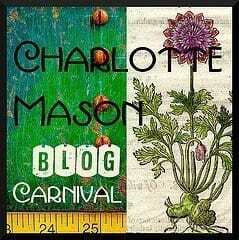 Without further ado, this is the Thanksgiving edition of the Charlotte Mason Blog Carnival. I just received the last entry – enjoy! We are beginning with Amy in Peru’s thoughtful post: reflections on a Charlotte Mason education. posted at Fisher Academy International ~ Teaching Home. In case you don’t know – Amy, her husband, Micah and their five kids are a homeschooling family serving as missionaries in Peru. Micah regularly travels down the river to visit remote villages, facing all of the kinds of things you can imagine he would in the jungle, where God has used him mightily. Reading their blog will give you and your children a detailed look at what jungle missionaries do. Micah often includes videos as well. Take a look! You will be blessed! While we are on the subject of being thankful this week, Dawn presents this helpful post listing her favorite books for Thanksgiving: Thanksgiving Books? posted at my4sweetums. Having the opportunity to teach and learn from living books is my favorite aspect of a Charlotte Mason education! Thankful for growing up in a home that prized books, Erin presents Emersion in Quality Literature posted at Seven Little Australians Plus One. Teaching from living books gets more and more fun as your children age, in my opinion. When you have high schoolers you get to dive into rich vocabulary, wrestle with themes and symbolism and identify plots and subplots. What could be more fun that that? Nancy presents her meaty post entitled Mistaken Identities and Mistaken Assessments posted at Sage Parnassus. In it she describes teaching Shakespeare’s A Comedy of Errors and all she learned about the play while teaching it. Great stuff! Two other favorite parts of a Charlotte Mason Education are Picture and Nature Study. Tricia Hodges’ Nana taught a pastel lesson with trees, water and reflection…with a bonus lesson from one of the students 🙂 described in Pastels Tutorial: Tree Reflection posted at Hodgepodge. You can reproduce the same lesson for your kids by following Tricia’s step-by-step directions – including pictures! On a similar topic, Sheri presents Artist Study: John James Audubon posted at A Charlotte Mason Homeschool Sampler. I can’t read the name “John James Audubon” without remembering an incident from our early homeschooling years. We were attending our first symphony performance as a family, and the conductor had just announced they would be playing the James Bond movie theme when my then eight year old excitedly and quite loudly piped up, “MOM! DID HE JUST SAY JOHN JAMES AUDUBON? !” Michael had never heard of James Bond, but he knew all about John James Audubon! In this blog carnival Sheri also presents a second and very helpful article titled Nature Study: Ideas for a study book also posted at her blog A Charlotte Mason Homeschool Sampler. Take a look at her excellent ideas! I am ending this post with Ritsumei’s article called Just Swinging posted at Baby Steps, reminding us the value of including downtime in our schedules. Hoping you will take the time to relax with your family sometime during this busy week and count your blessings. Enjoy! Thanks, Amy! Hope you all had a wonderful Thanksgiving! wow. I fully didn’t expect it to take me this long to get back here! but I sure am glad I did! Thanks for assembling this lovely Carnival. I’m glad you enjoyed it, Tammy! Thanks for taking the time to comment and please visit again soon! Thanks for the compliment and for visiting, Maddy! Thank you for the information on Charlotte Mason. I will most certainly check it out. You have a wonderful website that I’ll have to visit again when I have more time. Just taking a few moments away from Thanksgiving weekend with my family. Thanks Amber, Bethany and Rachael, for taking the time to read and comment! Rachael, it is always a treat to have NZ readers! Thankyou Dana! And I second your thanks to all the lovely ladies that contribute to this carnival. I love CM’s ideas, and while I am not a purist at all, I am so thankful for the wonderful ideas and encouragement I glean from the web. Most of my friends in NZ homeschool, but few are aware of Charlotte Mason, or her methods. Thanks for hosting the CM carnaval. It is a great read! Thanks for hosting and I look forward to browsing through! Thank you for your contribution, Erin, and for taking the time to comment! Thanks for putting the carnival together:) Really enjoyed it. Hi Nancy, I’m going to make sure to tell my husband you called me ‘organized.’ Ha! Thank you for your post; it sounds as if you are a superb lit teacher! Happy Thanksgiving to you, too. This looks lovely. I am thankful for organized bloggers like YOU who put on such wonderful carnivals. Thanks also for including my post on Shakespeare! You’re welcome, Amy and Lori! I really love reading about your family and ministry, Amy! Micah’s jungle trips are amazing! I pray for you guys! And Lori, thank you for the blessing! I am feeling that time crunch today, particularly. 🙂 Blessings on your Thanksgiving! Love this!! Thanks so much for taking the time this busy holiday season. I enjoyed a few quiet minutes this afternoon with your carnival. God Bless you and may he multiply your time ten fold!! Thank you for your helpful contribution, Tricia! My mother is also an artist – I wish she had been close enough geographically to be a regular part of our homeschooling! What a lovely carnival. And, you are so right! We have so much to be thankful for. “That they can listen to music and paint as well as do their math.” 🙂 Love the Thank You photo at top.